Exclusively equipped 2-room apartment in the house "Storchennest" with about 42 square meters on 1 level (ground floor) for up to 2 people. Centrally located in the district Dorf in St. Peter-Ording. All shops and restaurants of the pedestrian area are within walking distance and the beach is also only a short walk. Make a comfortable holiday, typical of the country under thatch. Living room with sofa for 2 persons, armchair, TV (cable), DVD player and stereo compact system. Direct access to the beautiful garden terrace to the west. Semi-open kitchen with oven, dishwasher and fridge freezer. Bedroom with double bed (2x 90x200cm, comfort height: 65cm) and wardrobe. Bathroom (shower room) with floor-level shower, toilet, daylight and hair dryer. Hall with cloakroom, mirror and storage room with vacuum cleaner in the entrance area. Car parking space and bike rack available. Free Wi-Fi (LTE). The bed linen is provided. Towels can be booked. Smoking and pets are not allowed. 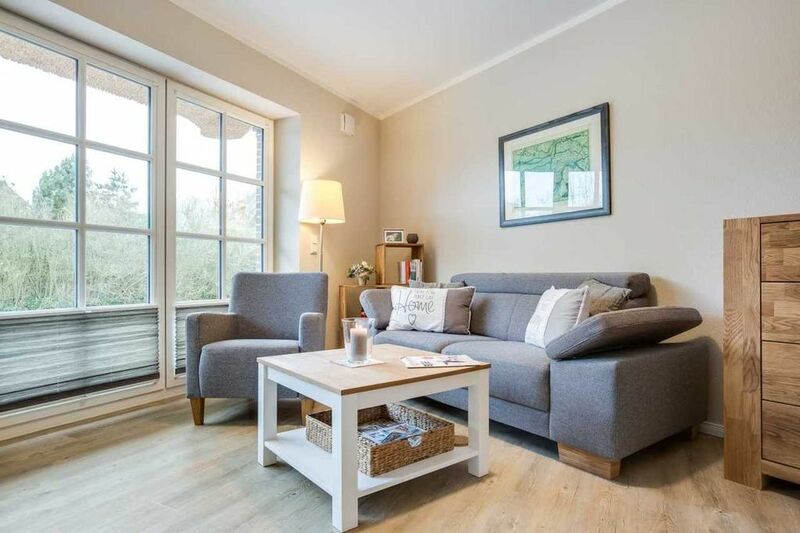 You live peacefully and centrally, shopping and restaurants are within walking distance from the house, the North Sea dike and the beach of St. Peter village can be reached on foot, by bicycle or by local bus (free with the spa card).